OK, let me be clear: this is not actually showing you the 3D structure of the nebula. It’s an approximation, a guess based on various assumptions on how nebulae are shaped. J-P broke the image up into layers, made a surface model of it, then remapped it all into different frames seen from different angles. He then put those together to make the animated GIF you see here. The structure may not be completely real, but it’s still awesome… and it gives you a sense of the shape and composition of the gas cloud. The star in the center is the ionizing source; that is, it’s a hot, young, massive star blasting out ultraviolet light, and that’s what’s making the nebula glow. The dark ribbons are filaments of dust which absorb optical light (the kind of light we see). Many of them seem to point toward the central star. That’s because at their head is a dense clump of matter, and that’s getting eaten away by the light and fierce winds from that hot star. Material from the clump gets blown back and away from the star, like sandbars in a stream. It’s a very common structure in nebulae like this. One thing that is pretty accurate is how the gas in the interior is blue, and red on the outside. This nebula used to be more filled with gas, but as the stars switched on inside it, their combined winds blew out a cavity, turning this filled sphere into a shell. Not a completely empty one, though: some gas remains inside, and its proximity to the central stars allows the oxygen in the gas to glow blue. Farther out, the starlight is too weak to make oxygen glow, so all you see is the ruddy glow from hydrogen. I’ll note the bright star just above the nebula is mu Cephei, a massive red supergiant, one of the most luminous stars in the Milky Way – possibly over 300,000 times more luminous than the Sun! It may or may not be at the same distance as the nebula – its distance is difficult to measure – though in J-P’s animation it shows up as being closer. This sort of modeling is fascinating, and really stunning. I’m not sure there’s scientific value to it just yet – like I said, it’s more art than science, since the structure you see is a guess. Still, I love the aesthetic of it. 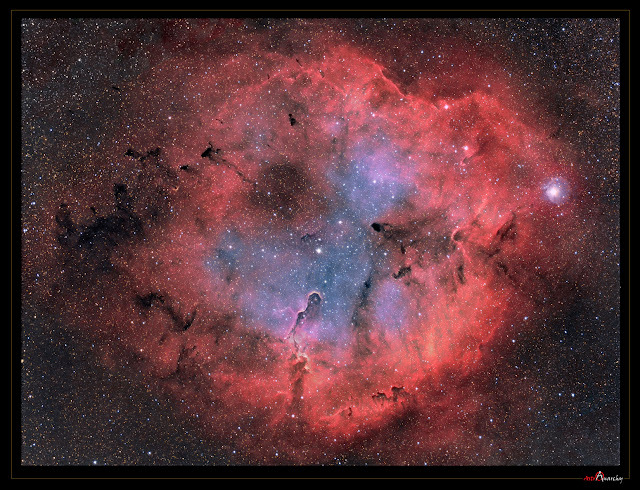 J-P has created several anaglyphs of celestial objects, and really all his astronomical imaging is lovely, and worth your time to peruse. – A stunning star factory for Hubble’s 22nd!